Soft and creamy Rosemary Chease has strong aromatic and fragrant flavours in every slice and is reminiscent of focaccia. 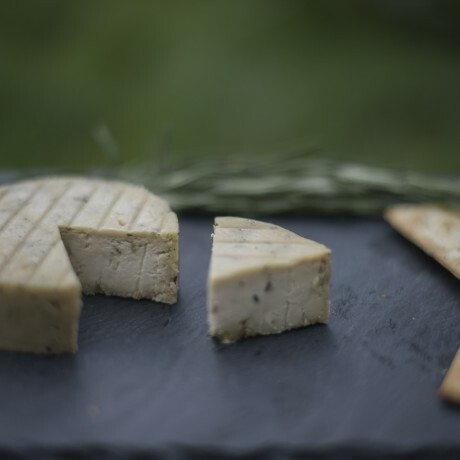 Hand made vegan cheese alternative made using the finest organic cashew nuts. Delivery information: This product is made fresh to order (allow up to 5 days) and then dispatched with Royal Mail 1st Class. This product contains cashew nuts and is made in a kitchen that handles sesame seeds and mustard seeds. Sorry, I wish I could be more positive. I suspect that the probiotics are what give it the horrible flavour. And it costs about 9 quid for the displeasure. Thanks delicious vegan chease I have enjoyed with crackers. Thanks delicious vegan chease I have enjoyed with crackers. Tried a mustard one and Ethiopian spice both super since not long ago I didn't know cashew cheese existed! Definitely the best vegan cheese I've tried. These cheeses are delicious. I've been vegan for many years, and although the quality of vegan cheeses has improved, I had never experienced pleasure eating them. I have now. The flavours are exquisitely balanced, and the texture, although not quite like cows' cheese in consistency, is very pleasant. I've so far had them with crackers only, but I think they'll be quite a delicacy with fruit, and in sandwiches. The only improvement I can think of is a bit less salt. If the salt were adjusted a wee bit, I expect these cheeses would win over many a non-vegan. The chease was bought as a gift for a vegan friend so I cannot comment on the taste. However the chease arrived in good time and was well packaged. I am certain my friend will enjoy it. Really lovely vegan cheese, all 3 flavours in the trio were amazing. Really lovely vegan cheese. Arrived by Royal Mail and a bit sweaty on arrival.But ok once refrigerated. I bought these Cheases for my daughter. I bought these Cheases for my daughter. She is thoroughly enjoying them. "Chease" artisan, Ami Tadaa, makes by hand a unique range of vegan cheese alternatives using the finest organic ingredients.